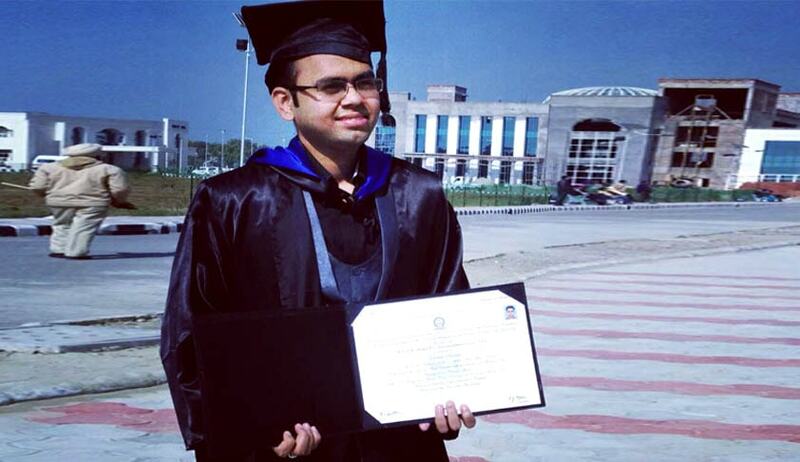 This year Arnab Naskar from Rajiv Gandhi National University of Law (RGNUL) had received DAAD scholarship. LiveLaw: How do you feel after getting one of the world’s most prestigious scholarship. How does it feel to be in a student at Europa Kolleg Hamburg, Germany? Arnab Naskar: Firstly, I would like to thank you. I was really delighted when I received the email from DAAD that the panel did consider me worthy enough for the scholarship. Apart from the scholarship, DAAD also provides tremendous encouragement and support to settle down in a foreign land. From bank account to accommodation, language training to residence permit, they minutely supervise every requirement of the scholarship holder. This made my initial days in Germany hassle free to a large extent. Sofar the experience at Europa Kolleg Hamburg (EKH) has been a rewarding one. The smaller batch strength is an advantage for the student as they can have personal interaction with the professors and can indulge in constructive debates during the lecture sessions. LiveLaw: Please tell us about your journey of being a DAAD scholar, starting from how did you get to know about the scholarship to application, selection procedures and finally becoming the DAAD scholar. Arnab Naskar: Like every other scholarship application process, DAAD also requires a long commitment and dedication right from the day it releases its application deadline. The applicant is required to collect recommendation letters, transcript (if (S)he is still pursuing her law degree), prepare letter of intent and have to collect other documents which include certificate for language proficiency (English). The entire exercise is time consuming and equally tiring. DAAD will then scrutinize the application and short-list candidates for the interview. The interesting part of the interview is that it is being conducted by panel of academicians, from both India and Germany. They are interested to listen to the applicant’s reason for pursing masters degree. After the interview is conducted they usually declare the results within 3 months. LiveLaw: Who supported you the most to become the DAAD scholar? How much help did you get from the University and your Professors? Arnab Naskar: I have been blessed to have the assistance, input, and support of my well-wishers during my application procedure. I am deeply indebted to my RGNUL, Punjab Professors, Alumni, friends who gave their valuable suggestions on my letter of intent and have assisted me in every stage of application. I have also received tremendous support from my batch mate Mr. Mrudul Dadhich, who was a DAAD scholar for 2014-2015 batch, in both pre-selection and post-selection phase. I applied for the scholarship while I was working as an advocate in Delhi. So it was really hard for me to travel to Patiala to get the recommendation letter from the professor. However, to my surprise our registrar Prof (Dr.) G.I.S Sandhu and our associate professor, Dr. Anand Pawar readily accepted my request to write a letter of recommendation and also agreed to post them to DAAD office. LiveLaw: In your opinion what qualities and specialization made you the DAAD scholar? Arnab Naskar: During my bachelors course, apart from my academic studies, I was actively involved in writing research papers, participating in moot court simulations, involved myself in various research oriented projects. This helped to garner knowledge on contemporary legal developments. Moreover, I interned at around 12 places during my bachelors studies which helped me to have a holistic view about the professional world and its challenges from very early days. Interning at different locations demanded a lot of physical movement. This helped me to appreciate various cultures, traditions. I believe that all this facets of my professional and personal life helped me to convince the panel that I am genuinely interested for the scholarship program. LiveLaw: Which area of law you find the most interesting and you have maximum amount of knowledge? Arnab Naskar: I have a deep interest in the field of privacy laws, competition laws and Taxation laws. It will be naïve for me to claim that I have gained maximum amount of knowledge in these fields or in any other discipline. But I have tried to associate myself in these disciples both during my academic study and during my professional endevour. LiveLaw: You would have definitely participated in Moot competitions and have publications. How were they successful in your journey? Arnab Naskar: Yes, I did! I participated in Oxford IP moot (oxford round), Nani Palkhivala Moot Court Competition, 2012 (semi-finalist) and few other. I co-authored the winning entry of 8th Nani Palkhivala research paper competition organized by the GLC Mumbai and have been the runners up of the Nani Palhkhivala competition organized by NLSIU, Bangalore. I also co-authored an article on General Anti Avoidance Rule which has been published by the IBFD journal, Malyasia. I have faced many failures during my journey but I have tried to utilize the opportunities I received over the period. Every endeavor had its own story and each one of them have contributed to my success. LiveLaw: How did you prepare you CV or resume for applying for the DAAD scholarship? Which were the places you intern? Arnab Naskar: I never concentrated too much in expanding my CV with lots of activities. I participated only in those activities which sparked my interest. Frankly I tried to grab the opportunities I received during my bachelors studies which eventually helped me to make my CV diversified. I interned at erstwhile Amarchand & Mangaldas & Suresh A. Shroff and Co. (Delhi), JSA(Bangalore & Delhi), Khaitan & Co. (Kolkata and Delhi), Phoenix Legal(Delhi), DH Law associates(Mumbai), Fox & Mandal(Kolkata) and with some independent legal practitioners over the period. LiveLaw: What are you to studying at Europa Kolleg Hamburg, Germany? Arnab Naskar: I am pursing my Masters degree in European Legal studies. I have undertaken my specialization in the field of competition law. LiveLaw: Please tell us how does one go about the scholarship. What should the student concentrate on for getting scholarship? Arnab Naskar: As I have already mentioned that the application process is time consuming and it takes a lot of perseverance. Applicant’s CV must portray long commitment towards academics from their initial days in bachelors studies. For me academic grades are not the sole criteria to secure a scholarship; applicant must have an overall enthusiasm towards other academic activities like indulging in debates, writing research papers, assisting professors with articles, active involvement with editorial board of journals and so on. It is also an added advantage if a student indulges themselves in social activities like legal aid and other legal chairs. LiveLaw: Message for the law students who are willing to apply for DAAD scholarship in future. Arnab Naskar: Mere scholarship amount must not influence the applicant’s choice of institution. The course structure and the applicant’s interest must be given due preference while applying for the scholarship. This is not the only scholarship available so its better to apply for other scholarships also. Lastly, I would like to say that do not get de-motivated with failure. Life is more than securing a scholarship. Learn whatever you can, be receptive, responsible and carefree.